United India Insurance Online Payment: United India Insurance Company has recently launched various Online Services for the convenience of the clients such as Online Payment, Online Buying, Online Renewal Services. The UIIC Online Payment is one of the best online services offered by the company for their clients. By using this United Insurance Online Payment, one can pay the premium amount anywhere anytime within minutes. The policyholder can also make United India Insurance Payment in offline mode. In this method, the insured must visit the nearest United India Branch Office within the grace period of their policy. The insured should also fill the corresponding documents with challans regarding their policy for making payment. As it is a time taking process, most of the people prefer to online mode for payment. Because in today’s busy life, everyone hesitates to visit the branch office regularly. So, to reduce the effort of their customers, United Insurance Co Ltd has started United India Insurance Payment through Mobile. United India Mobile Premium Payment is the easiest method to pay the premium amount as the process will be done within few clicks. With the help of United India Insurance Online Payment, the insured can also renew any of their policy through Online. Hence, go through the following sections of this article to know more about United India Online Premium Payment process. Every year United Insurance Company India offers many customer services. UIIC Mobile Premium Payment is the latest service provided to their clients to save time and money. United India has over two crore customers, a suite of 180 products and their annual income premium exceeds Rs. 6,300 crores. The Company is hopeful that in a few years from now, 5 to 7 percent of their clients will use the mobile platform to pay renewal premiums. So, United Insurance Company Limited has launched a mobile application under the name M-Power, i.e., empowering their customers to make premium payments on the mobile. Hence, the UIIC M-Power mobile app allows existing customers of UIIC to renew their policy using their mobile phones. United India Insurance offers an IMPS service which is the extremely convenient facility for transferring the funds 24×7. By United India IMPS Service with instant confirmation by SMS for the debit in Insured account and credit in the nominee’s account. But to avail this latest facility on Policyholder’s mobile, they must follow some steps. The process of United India Insurance Premium payment using IMPS is as follows. First of all, visit United India Insurance Official website, i.e., www.uiic.co.in. On the bottom left of the home page, go to Quick Link window. 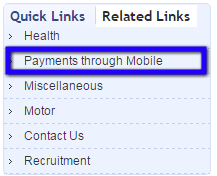 Click on Payments through Mobile Option as shown in the image. By clicking that, a new Page, i.e., United India M-Power page will appear on the screen as shown below. Go to the following link from the page as shown in the above image. Now you will redirect to a new page as under. In that, select the authorized banks from the list which are specified by the United India Insurance. Subscribe the Mobile Banking service with authorized bank specified by the UIIC and register for IMPS (Interbank Mobile Payments Service). The authorized bank will give a Mobile Money Identifier (MMID) and password to the insured for mobile transactions (MPIN). The Policyholder will have to install the Mobile Banking Application of selected authorized bank on their mobile. The selected bank should be a participant in the IMPS Merchant Payments service. With this, your United India Insurance Online Premium Payment through Mobile has completed. Thus, using these IMPS Services, the policyholder can pay the premium for United India Insurance easily within minutes. Like this, you can make online payment for United India Car Insurance or United India Insurance two wheeler insurance or for any product of United Insurance Co Ltd.
With the United India Insurance Online Payment facility, one can renew their policy easily within minutes. One can renew their existing policy in different ways such as through Renew Now option, Quick Renewal, and Easy Renewal by Mobile option. The policyholder should follow the below steps for the UIIC Online Renewal. Visit the official website of United India Insurance Co Ltd.
On the top right of the Home page, Insured can find a Renew Now Option. On the mouse hovering, the policyholder can check the list of United India products such as Health Insurance policy, Motor Policy, House holder’s policy, Shopkeeper’s policy, and Personal Accident Policy. Choose the insurance policy from the given options as per your requirements. For example, if you want to renew your UIIC Motor policy, then click on Motor Policy Option. 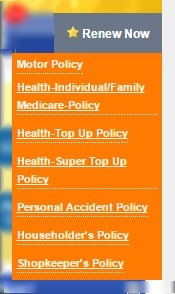 A new page will open which includes complete details of your policy. After clicking on the selected option, the policyholder can get the complete information about a particular policy renewal. Enter your Policy Number, and then click on Next button to Renew your existing policy. Follow the further process as per the instructions and make your United India Insurance Online Payment.